The Carer Card has been developed to reward and recognise all the hard work you do as a Carer. It offers discounts on a range of activities, products and services. 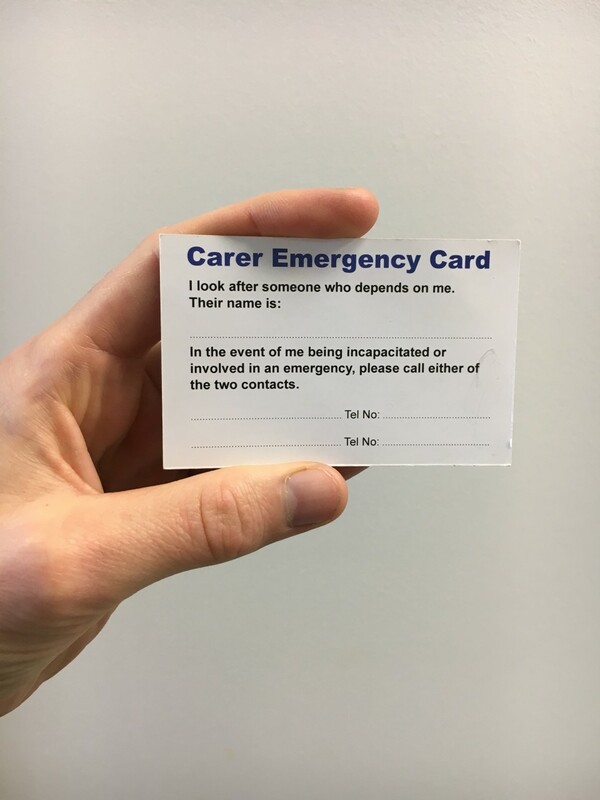 However many carers worry about what would happen if something unexpectedly stopped them from looking after the person they care for if, for example, they were involved in an accident or became ill. On the reverse side is the Emergency Card .This side of the card would alert others to the fact that you are an unpaid carer. It provides space for you to fill in details of two emergency contacts, who can support the person you care for. If you are incapacitated or involved in an emergency, the two contacts on the card can be called. They may be a friend, neighbour or relative. You may want to discuss this with them beforehand. You need to know that in this situation, alternative care arrangements can be put in place quickly and efficiently; the Carers Centre has a service designed to help you with this: creating an Emergency Plan. This is something that can quickly be put in place and will help ensure the person you care for is looked after, if you are unable to provide care yourself. Once the plan is completed keep this with your cared-for person’s Single Record if they have one, or keep a copy somewhere prominent e.g by the phone or on the fridge, or with their medication. The Carers Centre can also offer support if you would like some help completing the emergency plan – please contact the Carers Centre on 0114 278 8942 or use the Contact Us page on this website. For more information about the Carer Card and how to get one, click on Carer Card. 75% of disabled people and their families have no long term support plan. Families need help to plan for the future. Sense has put together a package to help you make decisions about the future. In their toolkit Decisions to make, steps to take, they take families through the process of making choices you need to.